Insurance as the name suggests provide assurance of payment of fixed sum of money in the event of unexpected loss against payment of some predictable sum of money called as premium. It is tool to hedge against the risk of contingency. Thus it transfers all the risk from the insured to the insurer or the insurance company for a certain fee. Hence, insurance policy allows individuals, businesses and other entities to protect themselves against potential losses and financial adversity in exchange of a reasonable premium. Insurance is something that everyone will need at some point of their lives. This includes life insurance, motor insurance, health insurance, travel insurance, home insurance, etc. Here in this article, we highlight one of the simplest and cheapest forms of life insurance, known as Term Insurance. Term insurance is the purest form of insurance. The policy will be in force for a particular term (say 30 years or up to the age of 75) and then comes to an end. During the time policy is in force, the insured pays a fixed premium to the insurance company at regular intervals. This is called premium, and if during this time if the insured dies, the insurance company pays a guaranteed amount of money, known as sum assured, to the family of the insured. In case the insured survives the period of insurance, the policy terminates and nothing is payable to the insured. All the premiums paid till date go to the insurance company. Hence term insurance products offer only risk cover without any returns or any maturity value. These policies are relatively much cheaper when compared to traditional insurance products and cater to the specific needs of an individual, i.e., to cover the risk of death. Term insurance is provided by almost all life insurers. Why Term Insurance: When an individual starts earning, he is expected to earn till the time he retires and his family is dependent on his income. With his recurring income and his savings, he fulfills his various financial goals. However, life is uncertain and an unfortunate event such as death or permanent disability can cease his capacity to earn. Hence every individual is required to protect his family against any unfortunate attached to his life so that his family continues to enjoy the same standard of living even if he is not alive. 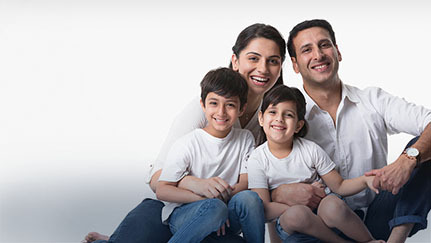 Term insurance allows individual to take huge sum assured with small premium. For example: a 30-year-old man who wants to get his life insured for Rs.1 crore has to shell out only Rs.7,000 to Rs.8,000 every year to protect himself for next 30 years. Online: In this agreement, the insured ties up directly with the insurance company and no agent is involved in the process. The individual uploads all his data online and submits the same to the insurance company. The insurance company does the necessary medical check-ups, accepts/rejects the proposal and informs the insured through mail. The premium is usually cheaper when buying insurance online as the company saves on commission + other operating costs involved in issuing a policy offline. The only disadvantage is that this is a DIY (Do It Yourself) service and hence there is no assistance from an advisor. Offline: Here, the individual interacts with a representative of the insurance company, which is usually an agent or advisor, and arrives at the right sum assured based on the agent’s advice. The advisor helps him fill the form and arrive at the correct premium amount as well. The client is also expected to get the after sales services like premium payment reminders, assistance in claim settlement, etc. Conclusion: Term insurance provides a large death benefit for less premium. As a thumb rule, an individual should be insured for about 10 times his or her annual salary. One should buy term insurance at an early age (as and when one starts working) in order to get a higher sum assured at a lesser premium. The more you delay, the costlier will be the premium. Provide an adequate amount of financial stability for your family! To learn more about our Term Insurance Plan click here ! whether the term plan is appilcable for NRI’s. Pl. clarify me if not, what are the plans available for NRI’s. If you are interested in purchasing this plan, please revert to us with your phone number and we shall arrange for a callback. I am 29 years old and willing to buy term plan online, please guide me or provide me the link to buy. please guide me how to proceed and call me if required, at my cell phone 9969******. We would be glad to assist you with your requirement. Our representative will give you a call soon. Thank you your interest in our product. We shall have the required details sent over to your email id. In the meantime, if you could also provide us with your phone number, it would help us to get in touch with you. I am looking for a Term insurance of Rs. 50 lacs, I m in the category of non smoker and non alcoholic. Thank you for your interest in our products. Our executive shall get in touch with you via e-mail soon. In the meantime, if you could also leave us your phone number and let us know which kind of insurance you are looking for, we shall arrange for a callback as well. Thank you for your interest in our products. Our executive shall get in touch with you via e-mail soon with the requested details. In the meantime, if you could also leave us your phone number, we shall arrange for a callback as well. I want a term insurance Plan of Rs. 7500000-00 with Accidental befit. My date of birth is 17-7-1977 and non-alcoholic and non-tobaco. My want a insurance for 30 or 35 years. Pleas infomr me the annual premium. so that I can complete all formalities and send the amount by cheque to Kanpur head office. Thanking you and awaiting your immediate reply. Thank you for the interest you have shown in our company. We shall arrange for a call back with our executive, who will guide you further.